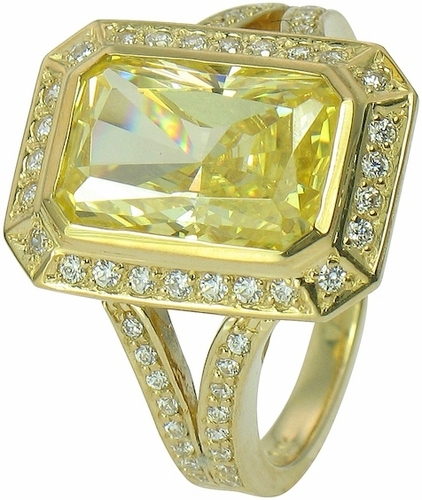 The Perusia Radiant Emerald Cut Cubic Zirconia Emerald Pave Halo Split Shank Ring features a custom cut 14x9mm radiant emerald cut yellow canary diamond look center stone. 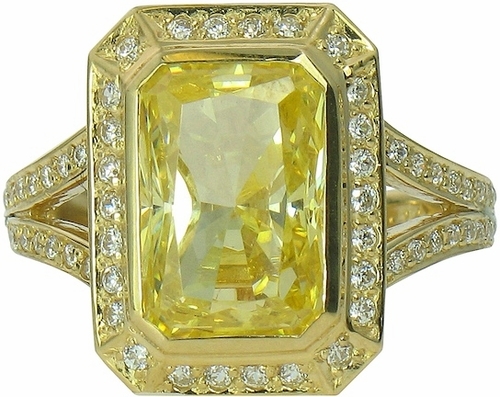 The bezel set center stone is framed by a single row halo of pave set round diamond look cubic zirconia. 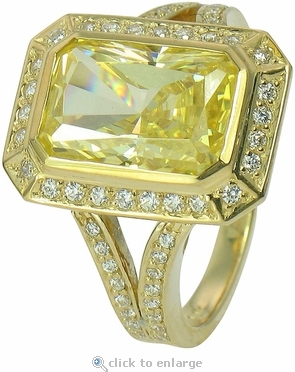 This emerald radiant cut center cubic zirconia, in a stunning canary yellow diamond look, exudes luxury and elegance for a beautiful and timeless design. The custom cut center stone is approximately 7 carats and is further enhanced by additional pave set rounds halfway down the split shank. 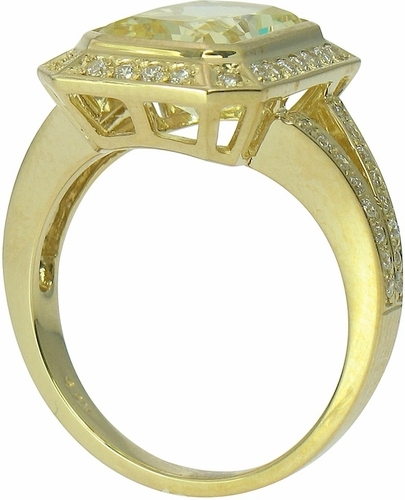 The total carat weight is approximately 8 carats of the finest diamond simulants available. Ziamond features the finest hand cut and hand polished cubic zirconia made with the original Russian formula for the best possible finished look with our solid diamond quality 14k gold, 18k gold and Platinum mountings. Clearance items are stocked in a certain finger size(s). They may be sized for an additional fee. Please see menu options. Sizes below a 5 or above an 8 can be made via Special Order. Please call 1-866-ZIAMOND for a quote.